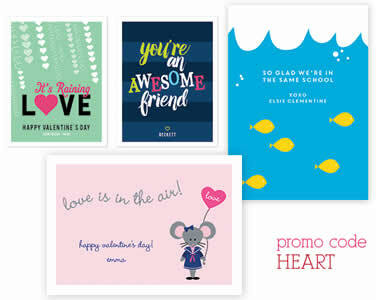 One of my customers, www.janicesinvites.com, is having a great sale. Check out these specials! 1. 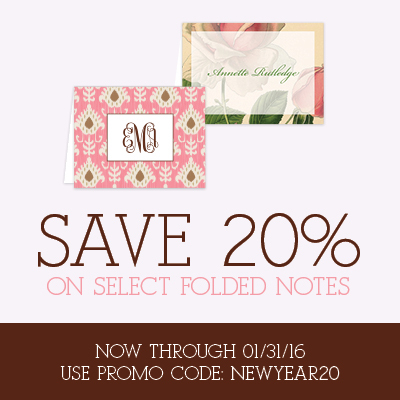 Boatman Geller Foldover Notes/Thank You Notes: Additional 20% off our already reduced 25% off retail! Stock up on all you stationery now! Personalized with name or initials. Great for thank you notes from kids, miss you notes from mom, and any time you just need to keep in touch! 2. Valentines Day Cards, Invites, Stickers and Plates: Additional 25% off our already reduced 25% off retail! Great selection of cards for the elementary student classmate handout. Personalize with the students name. Stickers to put on those Valentine goodies and treat bags. Great for you teachers to hand out to your students! Photocards to send to relatives from the kids. Valentines Day plates to give as gifts or use to share treats. 3. 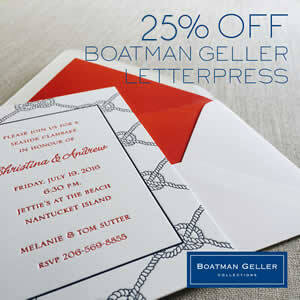 Boatman Geller Letterpress Products: 25% off, this line is normally NOT discounted! This line lets you design your own stationery … add an icon, two colors of printing, solid or pattern envelope liners, ribbons. Can be sophisticated or casual, design as you wish. Great for Bar/Bat Mitzvahs, Weddings, Moving Announcements, Baby Announcements, Invitations, Thank You Notes, anything you need. And we are also discounting matching napkins and cups so you can get everything for your party!